What is chrome.exe and why are there so many of them? You are correct that chrome.exe is the executable file for Google Chrome. The reason you have more than one chrome.exe process is a combination of the way Chrome runs plugins, as well as the way Chrome handles the process for each new browser tab. Just because all the tabs are in a single window, doesn’t mean Chrome treats it as one process. In addition to creating a new process for each Google Chrome tab that gets opened, chrome.exe runs as a separate process for plugins like Flash and Google Gears. This is meant to make the browser more secure, because malware shouldn’t be able to take over all chrome.exe processes. It’s also intended to boost performance, because the individual processes can be distributed across multiple CPU cores (if your computer has them). It is possible to force Google Chrome to run in a single process mode. Just edit the shortcut you click on when you launch the Chrome browser by appending –single-process following the shortcut launch info. You will likely still have more than one chrome.exe process, because this only makes the browser windows a single process. Plugins still run as separate processes in this mode. You can see details of each specific Google Chrome process by using the Shift+Esc keyboard combination with Chrome open. 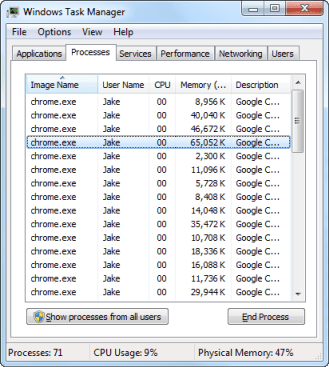 This shows Chrome’s own task manager. For an even more interesting look at what’s going on with Chrome, type about:memory into the address bar.